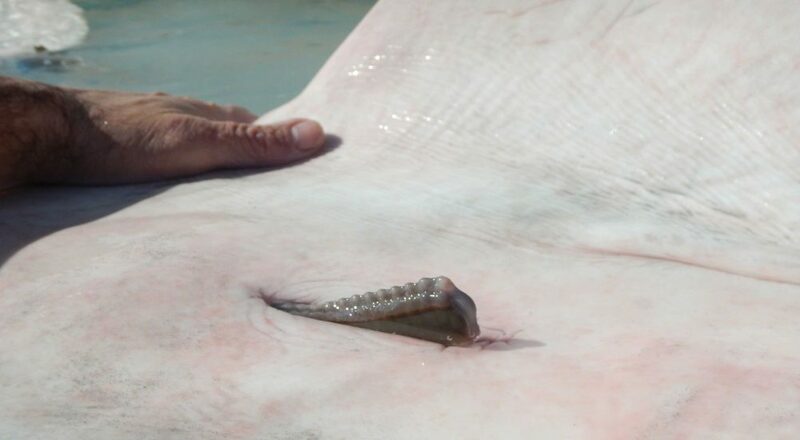 A surprising connection has been made between the first smalltooth sawfish Pristis pectinata tagged at the Bimini Biological Field Station and the pregnant female that delivered five pups in the first recorded sawfish birth in the wild on 7 December 2016. Dr Dean Grubbs, associate director of research at the Florida State University, and his team caught the female late last year. 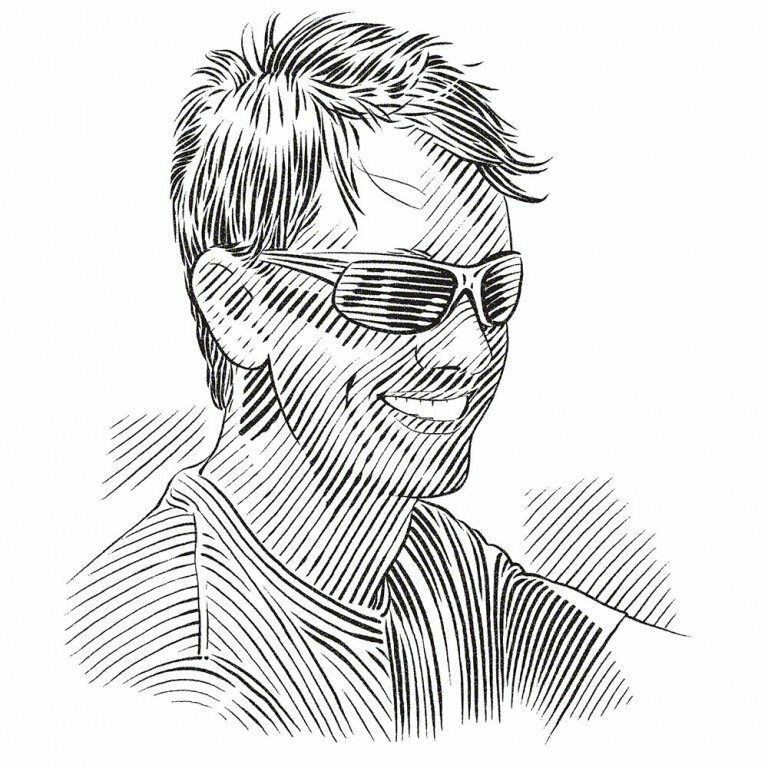 ‘It was clear she had been tagged; there was a part of some sort of streamer tag under the side of her dorsal fin,’ explains Grubbs in an interview. 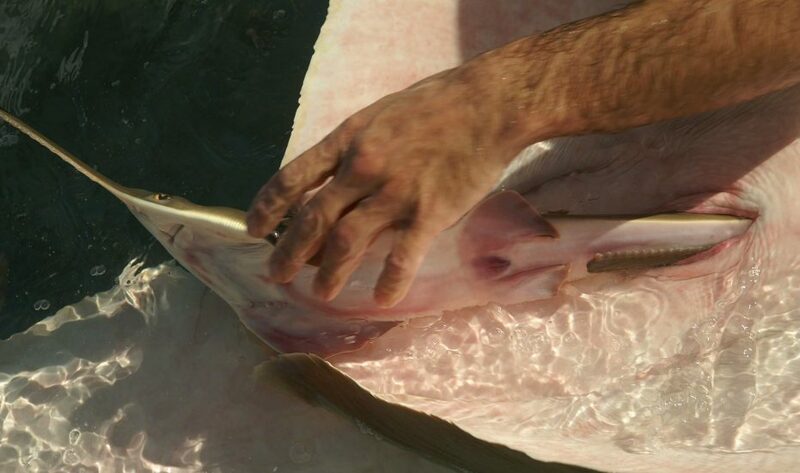 Few sawfishes of that size have been tagged in The Bahamas or Florida, but unfortunately, the tag numbers were indistinguishable. However, blood and DNA samples were taken from the mother and the pups and sent to Kevin Feldheim at The Field Museum for analysis. ‘When Kevin called back with the genetic results for both the mother and her pups,’ continues Grubbs, ‘he said to me, “Interestingly, the mom is a known sample to us. She is in our database as BIMPPE1, but I don’t have any collection data on her”.’ So a search began that led to an old e-mail from Dr Samuel Gruber and photos of Grant Johnson holding the animal in question. 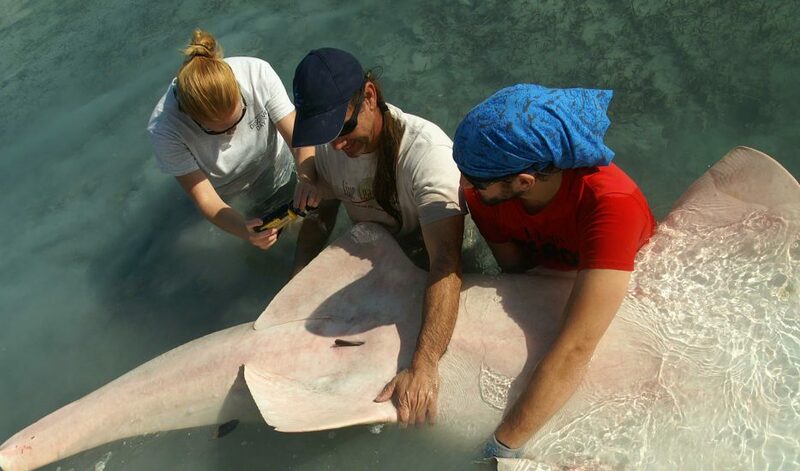 The female was caught on 29 April 2002 using gill nets on South Bimini, and at 2.6 metres (eight feet six inches) total length, she was an estimated three years old. When Grubbs and his team re-caught her in 2016, she was pregnant, had grown to 4.29 metres (14 feet) and was approximately 18 years old. ‘Obviously it was extremely exciting to figure out who that animal was, and of course, Grant’s reaction when I told him about it was fantastic!’ chuckles Grubbs. 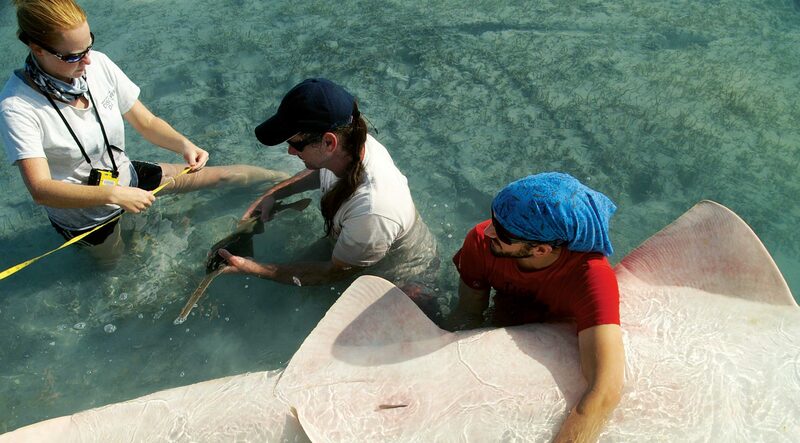 With so many basic life history parameters missing for sawfishes, the connection is an important step in decoding their lives. ‘How long does it take them to reach maturity, and at what size? How often do they reproduce? Of course, when you don’t start that work until they’re Endangered, you can’t do the standard methods of sacrificing animals to age them and look at their reproductive traits,’ explains Grubbs. 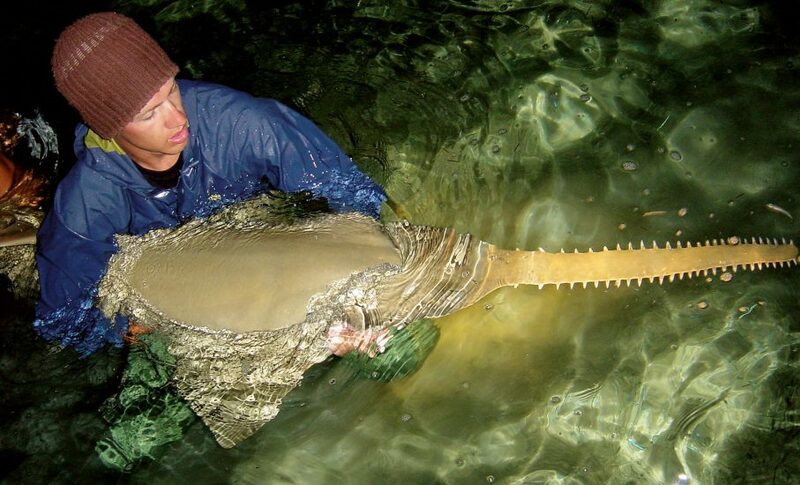 It is also vital to understand how and where sawfishes move in order to inform their protection, particularly where reserves are spatially delineated. It’s therefore interesting to note that this sawfish was originally caught on the Great Bahama Bank and nearly 15 years later was re-caught in the same region. ‘Having these long-term records is critical, and obviously, it also highlights the need to collect genetic samples, because you never know when they will be needed,’ Grubbs concludes.